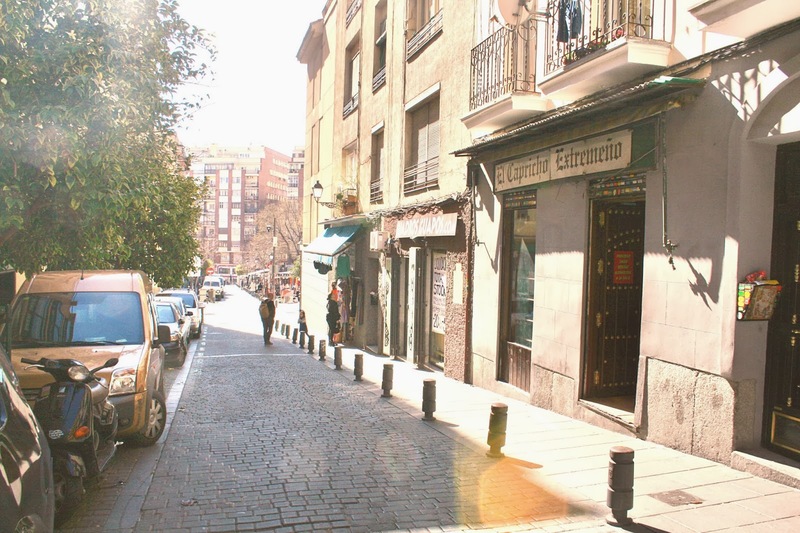 Tucked away on a narrow street, south of La Latina and west of Lavapies, there is a place. It barely fits the category of "restaurant." Monday through Friday its metal doors are closed and strewn with graffiti. But on the weekends, it comes alive. 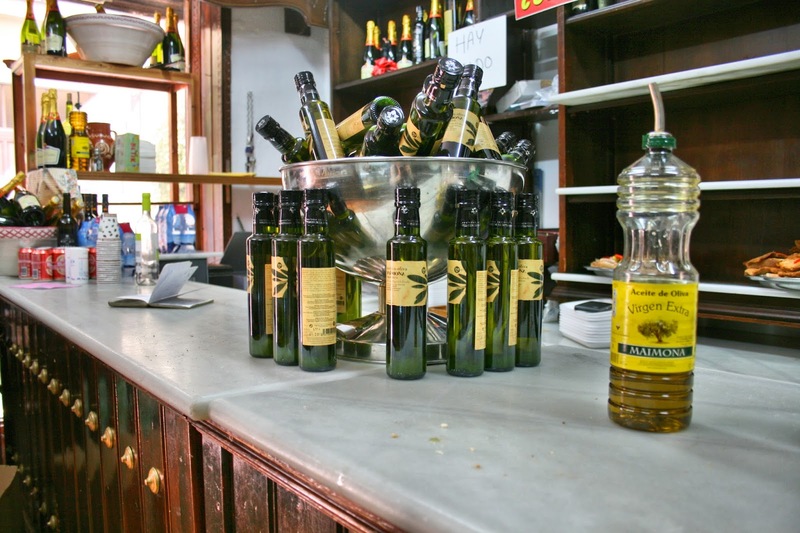 El Capricho Extremeño is THE place to go for cheap tostas on Saturday and Sunday afternoons. 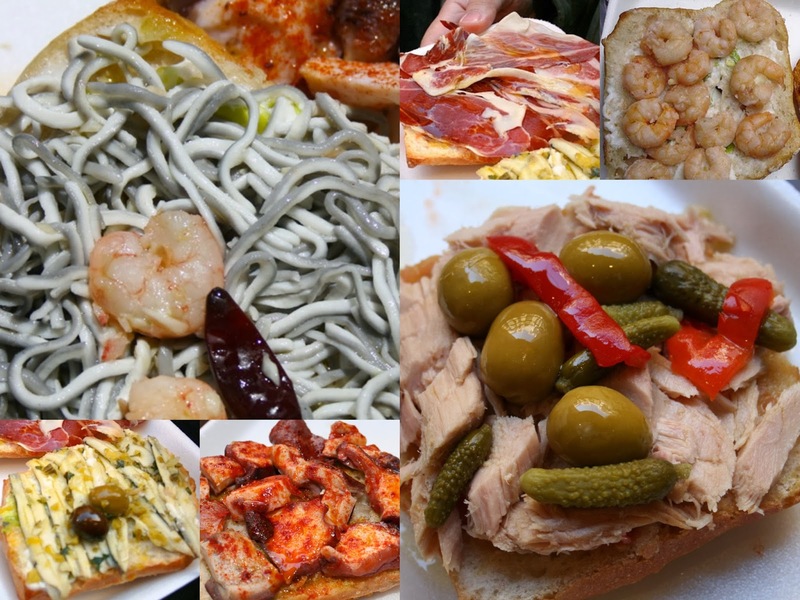 While there are no menus, no waiters, and no place to sit, it serves up some of the best open-faced sandwiches in Madrid. On some Saturdays, you'll be able to enter calmly and examine the sandwiches before telling the old, smiling man behind the counter what you want. If you're lucky, you'll even be able to order a beer to drink at the bar with your food. The tostas are not always the same each day, but at most times you can choose from an assortment - each one with a generous serving of toppings over ciabatta bread. The usual options are pulpo de Gallega (Galician Octopus), tortilla de patatas (Spanish omelette), bacalao con pimientos (cod with peppers, olives and pickles) ensaladilla russa (potato salad with veggies and chicken/ham), smoked salmon, toasted brie with raspberry marmalade, and of course Jamón Serrano (the very famous Spanish ham!). 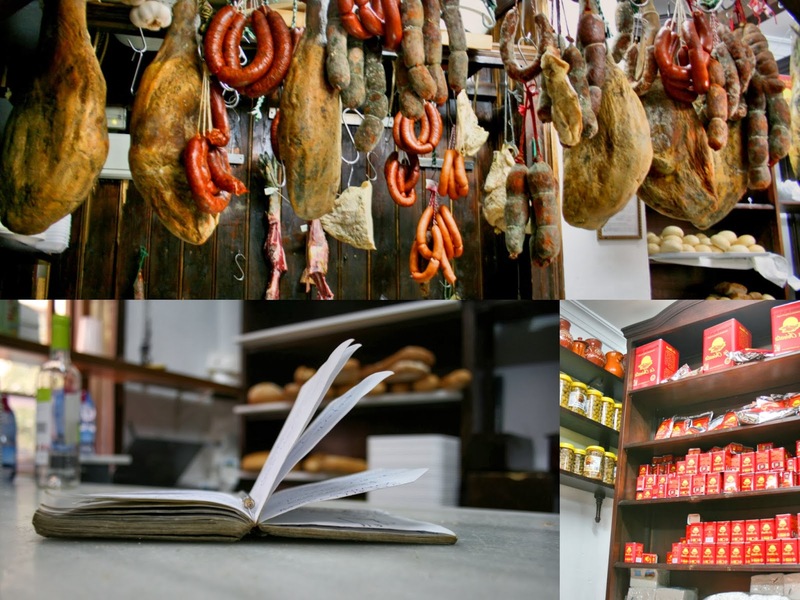 If you go on a Sunday, you'll find El Capricho Extremeño situated right in the center of El Rastro Market, Madrid's famous (and busy) open-air flea market. Get in the long line that trails out the door, but don't hesitate. You'll be placing shouting your order in less than five minutes. When you enter the door, elbow your way to the counter and take a quick glance at the offerings. Then, when the man shouts in a friendly voice over the crowd while looking at you, shout back and tell him what you want. 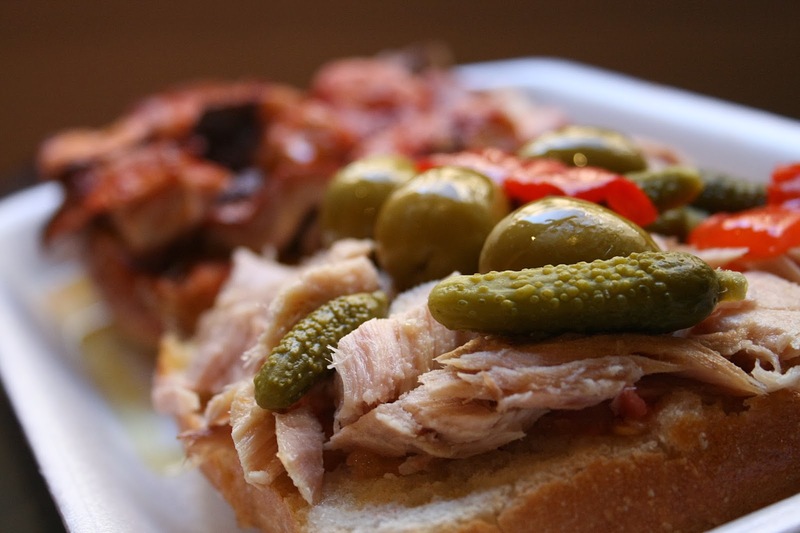 The sandwiches are cheap, so don't be scared to ask for more than one. He'll put them on a styrofoam plate and add a long drizzle of olive oil before handing it over. Give him your money and grab a few napkins before the line pushes you out the door. Then, go take a seat on a bench, curb or stoop nearby while soaking in the sun, people-watching at the market, and enjoying your tostas. It is the perfect Madrileño Sunday afternoon. El Capricho Extremeño can be found on Calle de Carlos Arniches, 30. The tostas are either €2.50 or €3 each. 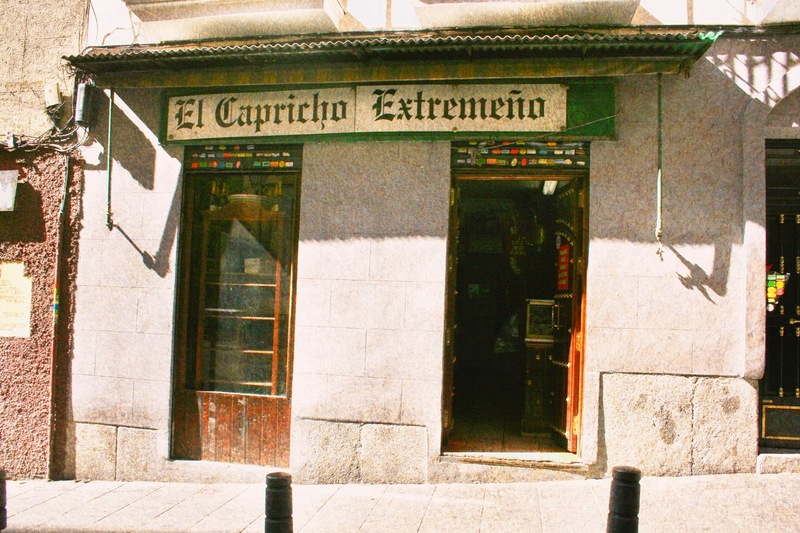 Have you ever been to El Capricho Extremeño? Will you try it? What are your favorite places for cheap, easy and delicious food? Let me know in the comments below! Absolutely love how you wrote this! Your descriptions matched the madness/awesomeness of El Capricho Extremeño perfectly!! I like the pics you were able to take of the bar, too. Is that a photo of your own notebook in the middle of the collage? Thanks! My DSLR has recently arrived in Spain, so I had fun with these photos. And no, actually the notebook was already there! Must belong to the man behind the bar. YES! Caroline is my wonderful new flatmate! 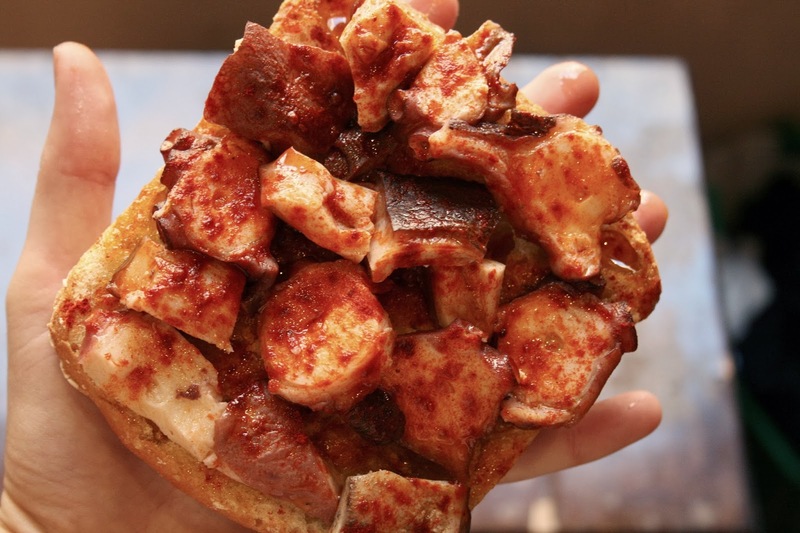 Come over one weekend and we'll go for tostas? The place is conveniently located in front of my piso! This place looks like it has so much character! I love discovering hole-in-the-wall places like these that are no-frills, but have a ton of personality. If I weren't allergic to bread, I would undoubtedly go tosta crazy here. Stunning pictures, by the way! No-frills, but a ton of personality. Those words are perfect! And maybe we can get you some breadless tostas one day? haha. The old man behind the counter would surely not understand, but we could try! I need to go here! Gosh so many places I still need to eat at!